Maintaining a bike is painstaking... and not easy as it appears. It does not matter even if you have a couple of servants to clean the bike. The 'U' factor is esential. How to maintain the bike is beyond scope of this article and rather how NOT to maintain is more that matters in this platinum page ! 1. Dont leave the bike in the open - exposed to weather elements. A decent bike cover will cost only Rs. 200 (or 3 pounds or 4 dollars in India... ). Alternatively imagine the cost for removing the rust and corroded metal and all the yuck! If you dont care about the bike better sell it for what you can get now than selling it as scrap later... U probably can get a few dollars more. "Penny wise, Bike foolish" - BT.copyRiGHT. 2.Don't leave the bike as is- If u are going away for a long time somewhere, sometime. Theres normally a procedure to follow in all bike service manuals so that vital parts stay fit n fine. Like you need to oil and service some parts before packing the bike safely away.Or disconnecting the battery. Even if u got a garage..dont leave it in the open. Weak and soft hearted readers please exercise caution for below picture set. Strange way to maintain a bike cruelly found in pics sent by one of the readers... 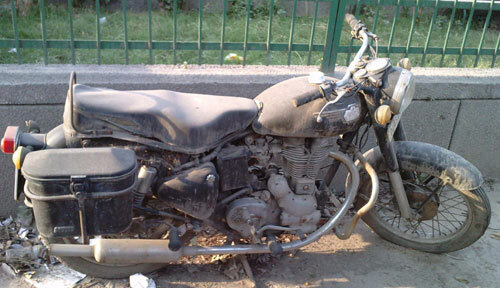 I wonder whats the intention of letting this classic Royal Enfield Bullet motorbike rust away. 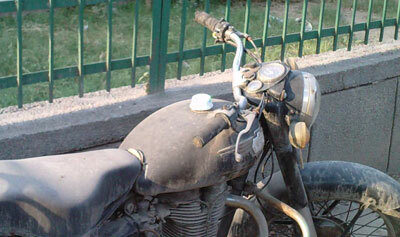 .Some one has also covered the petrol cap with a small ice cream cup. Im lost for answers and full of wild guesses.On one end I did come across news in north india about some youth stealing Royal Enfield bikes for sheer joy of riding them alone and at the other end these scenes...and there are others who are still saving up to buy an enfield at least a good used one - but what kind of memories can be kept alive by letting a bike "RUST in peace" ? DON'T Do. Ride on and take care - both u and the bike! Rust in Peace is also title of a studio album by American heavy metal band Megadeth released in 1990.